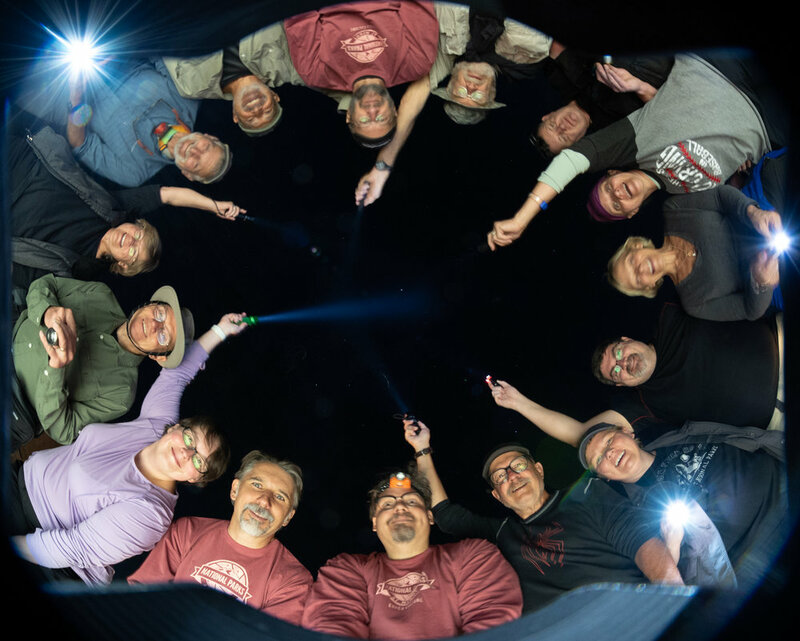 About two weeks ago I bid farewell to eight workshop attendees in Death Valley, who were all part of National Parks at Night’s second Ambassador Series adventure with Atlas Obscura. Why do I mention this? What’s the significance? Because those farewells marked the end of our 2018 campaign of leading eager night photographers into some of the most fantastic and fascinating destinations in the U.S. and abroad. 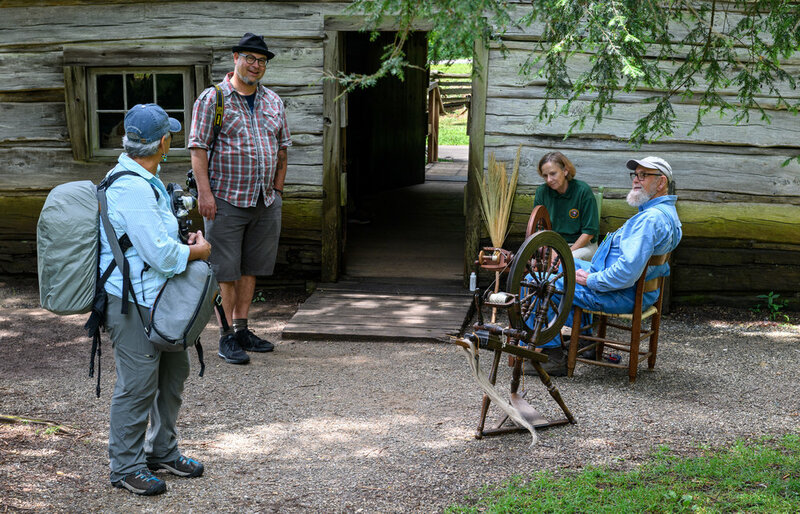 Over the past 12 months we’ve led workshops in six national parks, two national historical parks, a national scenic byway, a western outdoor art garden, and three countries. Back in June we recapped the adventures from the first half of our year in the blog post “So Far, So Good.” Now, to round out our coverage, we recap our second half. Below you’ll find words, images and videos that reveal the journey we enjoyed with our attendees in 2018. Deep in southern Utah is one of the lesser-known jewels in a majestic crown of the state’s beautiful parks: Capitol Reef. 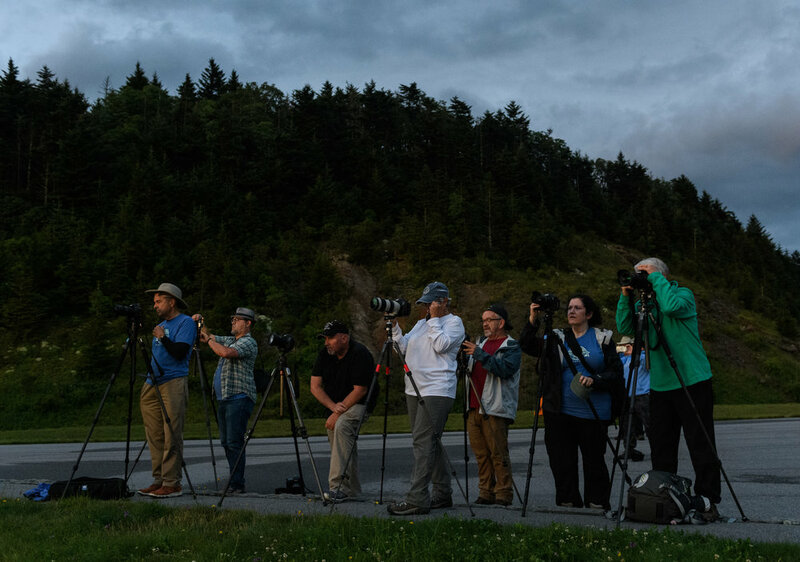 Featuring gold-tier dark skies and an impressive geologic scale, it was an ideal place to host a June workshop. Gabe and I began with our first-ever backcountry experience. A smaller group traveled out to the Temples of the Sun and Moon to camp overnight. With 4x4 high-clearance vehicles and a sense of adventure, we conquered the remote northern tip of Capitol Reef’s Cathedral Valley. 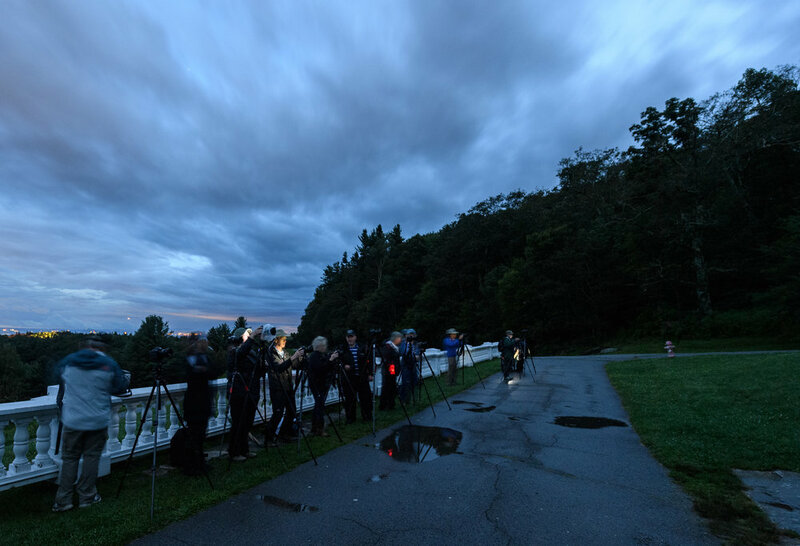 The main workshop began a day later, with a full complement of eager night photographers. It’s hard to say which location was my favorite, so check out the above slideshow with images from Sunset Point, Fruita Orchard, Chimney Rock, Capitol Gorge and more. We covered a lot of ground, including star points, star trails, light painting, light writing and night portraiture. All in all, we had an amazing, tight group of people who came together in the desert to make beautiful images and to enjoy the natural and gargantuan scale of Capitol Reef’s features. 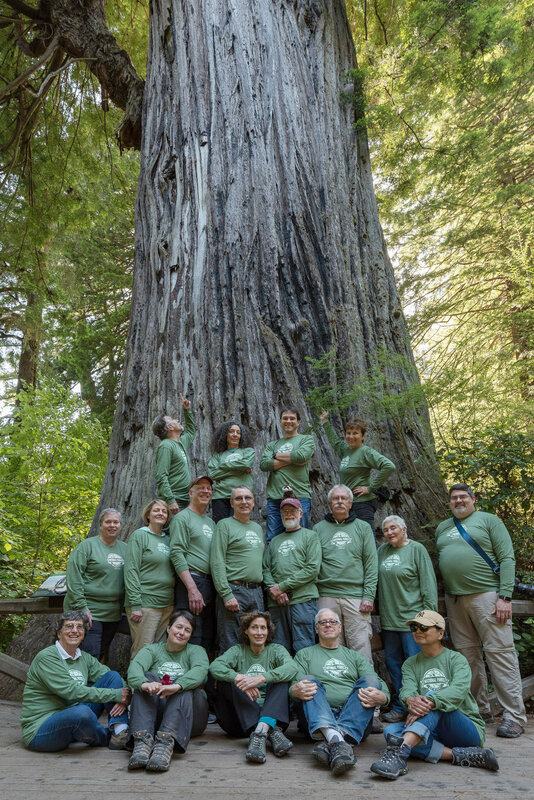 In June, we held a very special workshop at Redwood National and State Parks, which coincided with the national park’s 50th anniversary. 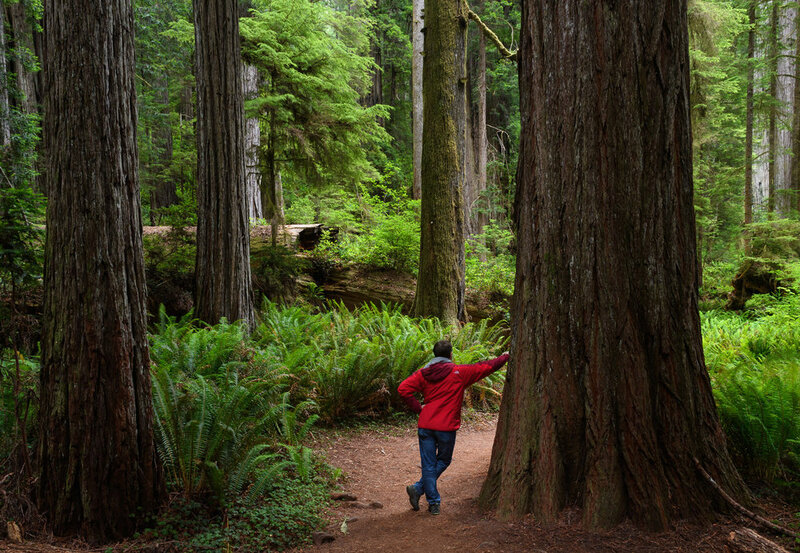 In 1968, Congress protected lands adjacent to three California state parks with the creation of Redwood National Park. 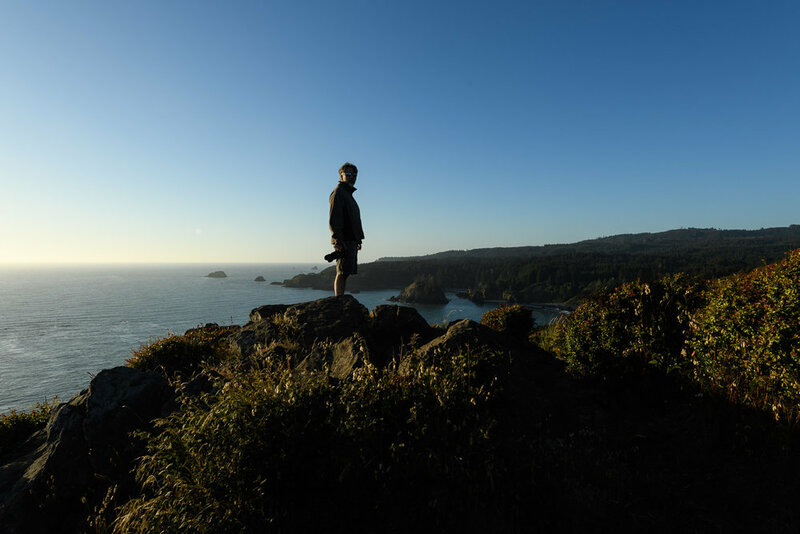 In 1994, the California Department of Parks and Recreation and the National Park Service concluded that joint management of the four-park area would be the best way to protect the fragile resources of the Redwood Coast. There are not many experiences that can compare to the awesomeness of walking in a redwood forest. Trees as tall as football fields are long, and sometimes 15 feet or more in diameter, have a way of clearing one’s mind and soothing one’s soul. They also tend to be rather difficult to photograph, in part due to their sheer enormity and in part because it can be difficult to work with your jaw dragging on the ground. It’s truly a breathtaking experience, similar to standing above the chasm of the Grand Canyon. 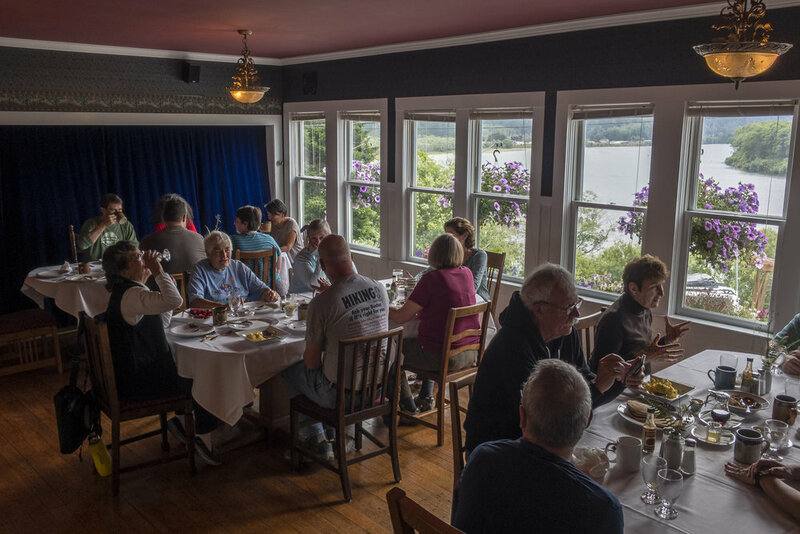 Our workshop was based at the historic Requa Inn in Klamath, California, which we had reserved in its entirety for our group. The small boutique hotel and restaurant proved to be the perfect base to explore the park––it was welcoming, comfortable and convenient, being situated more or less in the middle of the long stretch of shore that encompasses the redwoods and coastline that we were there to admire and photograph. Because we had the run of the entire hotel, we were able to set the cooking schedule to our needs, with a late breakfast and early supper, enabling us to both sleep in and to get out into the forest to photograph while there was still some available light to work with. Did I mention it was dark in the forest? Only 3 percent of sunlight penetrates the canopy and filters down to the forest floor, so theoretically, the same goes for moonlight and starlight—so yeah, it was dark in there. Chris and I arrived a couple of days early and determined that the best strategy for the group would be to arrive in the forest before sunset and figure out a composition or two while we could still see our cameras on the tripod in front of us. Light painting was a critical component of every shot, and workshop veterans and newbies alike were both challenged and inspired. While the true stars of the park are the trees, the coastline of far-northern California is spectacular in itself, and we divided our time between the two. We spent a night outside of the park at the outstanding beach in the small town of Trinidad. 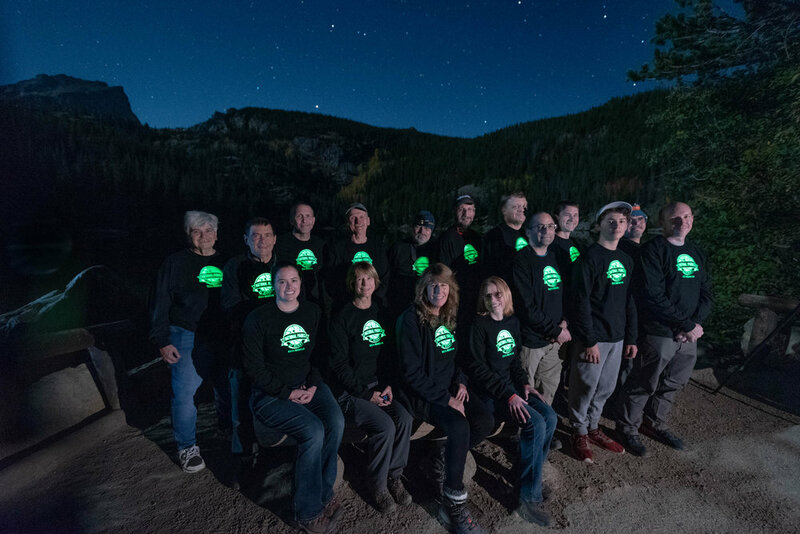 And one of the highlights of the workshop occurred on the last night when two of our veteran participants led an impromptu light writing extravaganza for everyone at the aptly named Big Tree. It was a great way to end a spectacular week. This summer we embarked on our first road trip, cruising along about two-thirds of the 469-mile Blue Ridge Parkway, stopping both day and night to photograph the rolling hills, the winding road, the tunnels, the bridges, the farmland, the landscape and more. We also photographed rain. Quite a bit, in fact. Precipitation fell almost every day of the trip, at some hour. It started on the second night, as we were planning to shoot Mabry Mill; not much was lost, as we returned the next day and shot it under perfect overcast conditions. 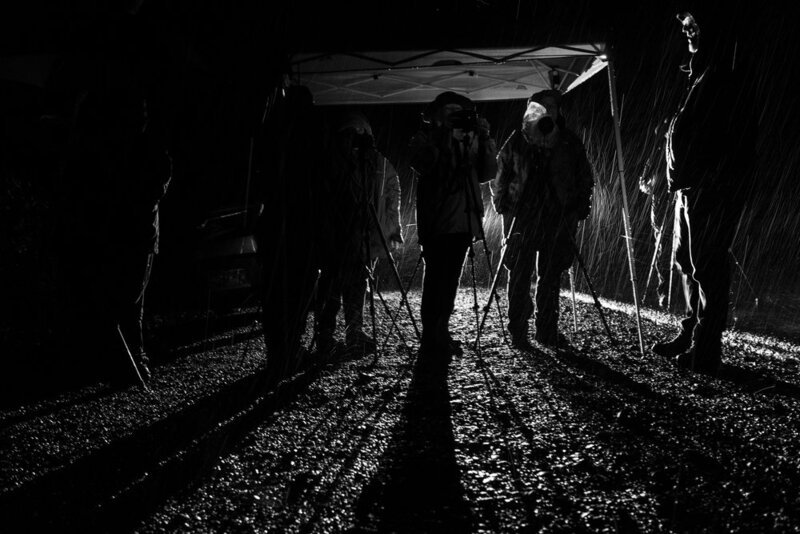 The third night rain washed us out once more, but again not much was lost, as we retreated to the hotel meeting room for a two-hour tethered demo on light painting. The fourth night, the rain retreated long enough for a great shoot at the Moses H. Cone mansion. Large holes opened in the clouds, revealing beautiful starry skies, and we light-painted the whole mansion with Luxli Viola LED panel lights. Alas, on the fifth night rain came again, but the group was not to be denied—we all donned rain gear, and one participant bought a portable picnic tent from a nearby Walmart that protected about half a dozen camera setups, and for about three hours we photographed car trails through one of the parkway’s iconic tunnels. 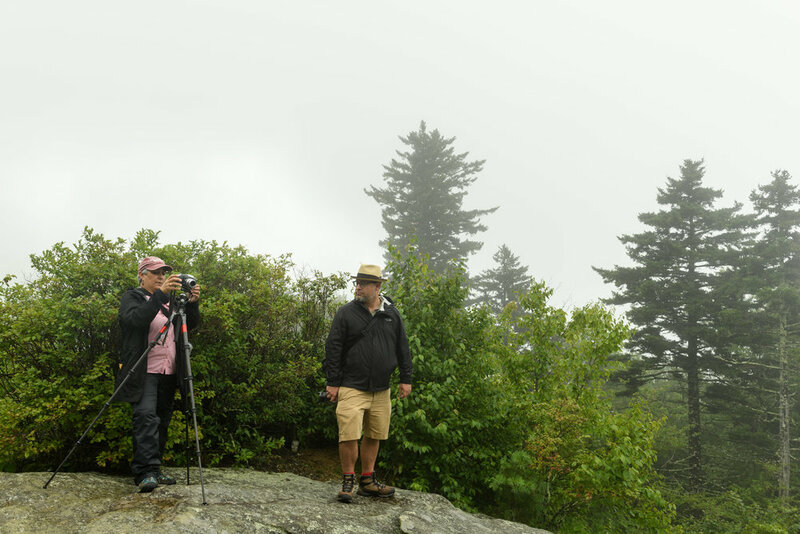 On the last night, the group ventured dry and high—all the way to the Richland Balsam Overlook, at 6,053 feet, the highest point on the Blue Ridge Parkway. We finally had a wonderfully clear night, and were able to photograph the Milky Way spanning over the landscape. Our road trip was not all about photography, though. 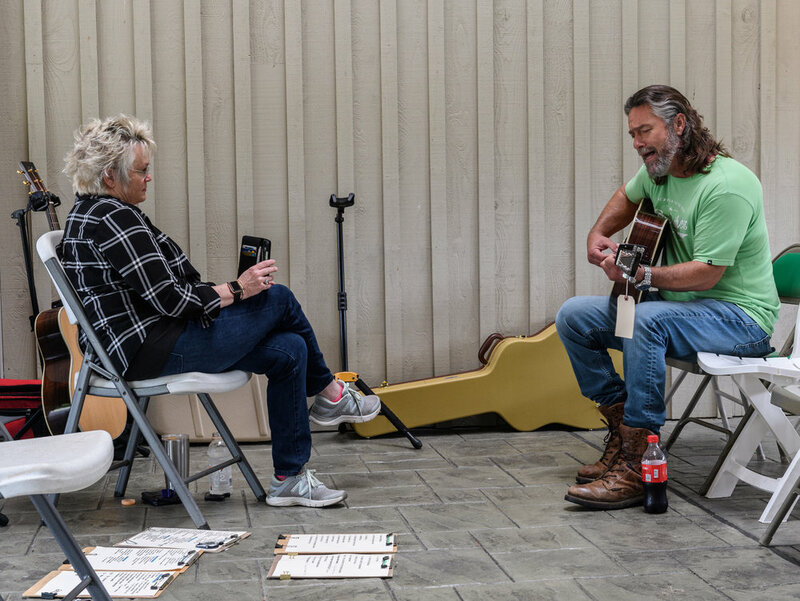 We shared a great many experiences, including dinner at the Peaks of Otter Lodge, brunch at the Mabry Mill Restaurant, bluegrass music in the breezeway at the Blue Ridge Music Center, BBQ in Asheville, and more. See ya on the road! When we first scheduled our Rocky Mountain National Park workshop for September, one of the things we hoped for is that we might catch some fall foliage. It’s hard to predict—you know the foliage will turn, but trying to figure out which week it will, over a year ahead of time, is an exercise in silliness. So you just take a shot and hope for the best. Well, boy did we nail it. Right as the workshop was beginning, the aspens of Rocky Mountain started lighting on fire with fall color, and our workshop attendees were all over it. Of course, there’s much more to this park than autumnal color. So much more. And we photographed all of it. 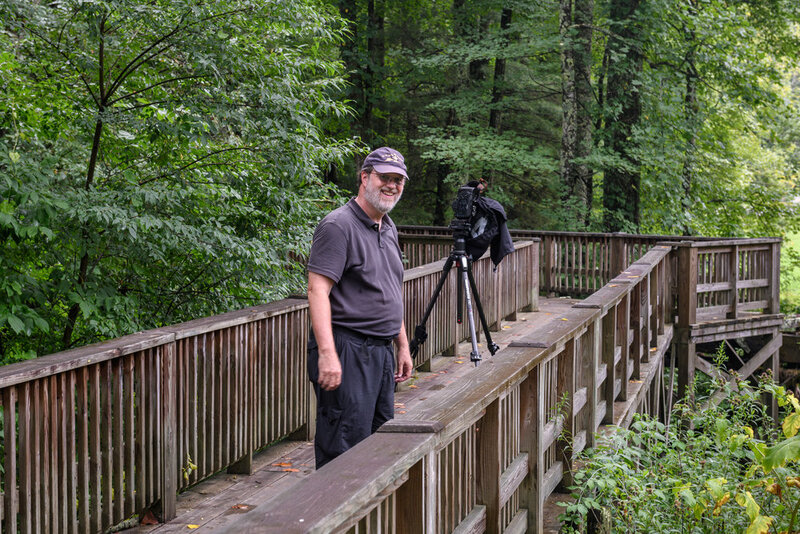 We photographed the valleys, the waterfalls, the lakes, the ponds. We made a day-trip to Grand Lake, where we had a group BBQ lunch, then hiked to and photographed the beautiful East Inlet. We braved the night cold of the tundra, where we photographed a lightning storm skimming the horizon. We made Milky Way images at the edge of mountain meadows, where we could hear the bugling and the clashing antlers of elk in the darkness. Then after the main part of the workshop ended, it was time for the optional backcountry add-on. We hiked about 2 miles up into the woods with five attendees to Dream Lake and Emerald Lake, two of the most scenic places in the park. We reached Emerald Lake in daylight, ate a picnic dinner, then started shooting as night fell. In the darkness, we slowly worked our way back down the mountain, photographing at each successive amazing location along the way, finally ending our night with one of the most stunning valley views in all the national parks, bathed in moonlight on a clear Colorado evening. As you likely know, there are a number of designations for National Park Service properties: national parks, national monuments, national seashores, national recreation areas, and national historical parks, among others. 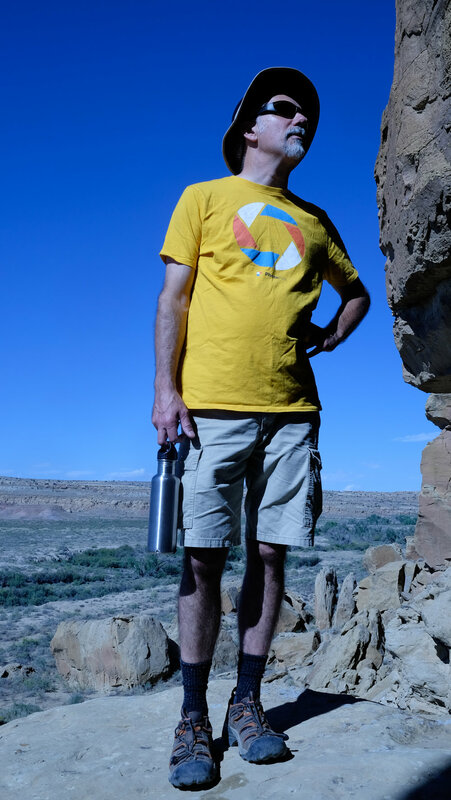 Matt and I led NPAN’s first workshop to a historical park in September, at New Mexico’s Chaco Culture, the site of the densest collection of ancient Puebloan structures in the world. 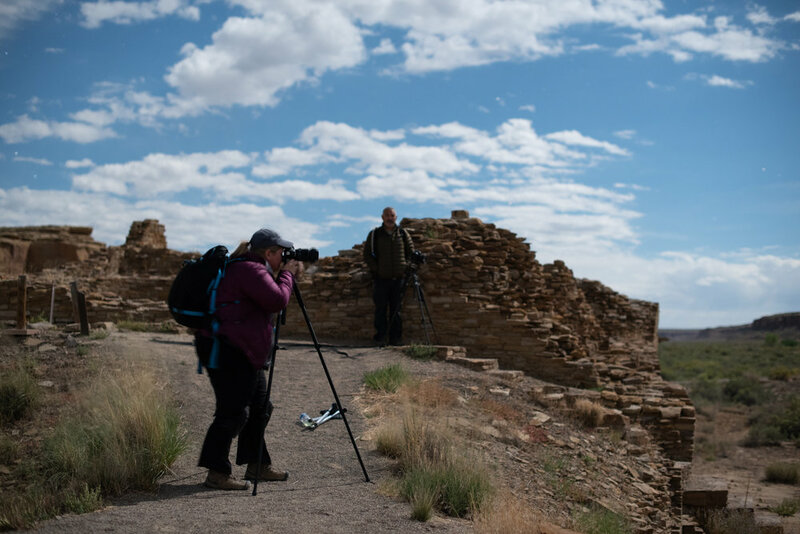 Photography at Chaco is all about the massive pueblos, as well as how they fit into the landscape. 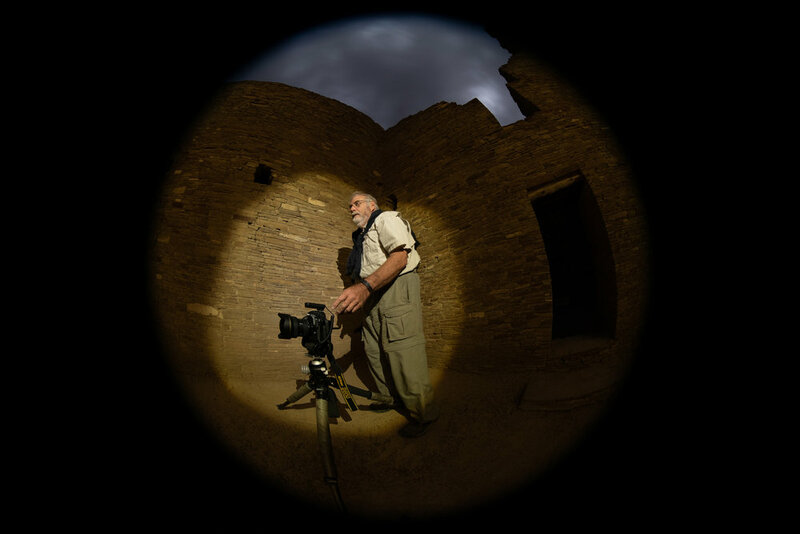 The various archeological sites at Chaco Canyon range from about 800 to 1,000 years old, and are the most significant feats of engineering from the ancient world in the American Southwest. We arranged for special nighttime access to the sites, which are closed to the public at sunset. Many of the parks we visit are remote and hard to get to, and Chaco is no exception. The nearest accommodations are well over an hour away, but there is a campground at the edge of the park. In order to minimize travel and get the most out of our time at Chaco, we elected to base ourselves at the campground and to use one of the spaces at the park’s visitor center for our classroom. Many of our participants opted to bring an RV, but a good number decided to rough it and go for tent camping. Our workshop coincided with this dark sky park’s annual astronomy festival—which was ironic because we were there during the full moon, specifically so that we had moonlight to illuminate the landscape while we focused on light painting the structures. Dr. Erica Ellingson and Nick Conant were there from the Fiske Planetarium at the University of Colorado at Boulder to present Ellingson’s Ancient Light program on Chacoan astronomy in their mobile planetarium, and we were able to arrange an extra presentation of the program for our group. Chris and Matt had just completed their Rocky Mountain National Park workshop, and they drove to Chaco from Denver so that Chris could join us for the first couple of days and nights. Of particular note was a high level of coordination and cooperation among the workshop participants, which proved essential while working in the tight quarters of the archeological sites. That’s not really a big surprise, because our groups are amazing, and we are truly fortunate to work with such great people on a regular basis. This was my last workshop of the year, and it was a great way to end it. Thank you to my partners at National Parks at Night and to all of the wonderful workshop participants I’ve had the pleasure to work with over the year. I co-led our second night portraiture workshop in Catskill, New York, with Tim. Over one intense weekend we worked with two local models, Rip and Galaexius, to make iconic and creative portraits in the Hudson River Valley and some cool locations in the Catskill Mountains. During the daytime, we did hands-on learning with lighting and posing models, as well as studying how to build up to a properly balanced exposure. In the evenings, we applied that knowledge in the field down at the river, as well as at the nearby natural art installation, Opus40. Our models were the bomb, and our attendees really stretched themselves to do the complicated task of not only making a great photograph at night, but also a thoughtful and deliberate portrait. Our last workshop of the year was in an incredibly unique location, the Sloss Furnaces National Historic Landmark. Located in Birmingham, and built in 1880 and operated until 1970, Sloss is the only 20th century blast furnace in the U.S. being preserved and interpreted as a historic industrial site. And we were the first group to lead a dedicated night photography workshop there! Our focus of the workshop was to interpret the location in black and white and to add a heavy dose of light painting. We had a diverse group of attendees—including several locals from Birmingham as well as people from Germany and both U.S. coasts—who came to explore the site with us. We were also thrilled to work very closely with Sloss. They gave us a private tour of the whole site to kick things off, and they worked very closely with us through the whole process. One of the big things that made this workshop so different for us was that we could return to the same location each night. The preserved footprint of Sloss is one-third of what it used to be, but it’s packed with a vast amount of subject matter. Participants could focus on a different subject each night, or they could revisit, reinterpret or finesse the same. 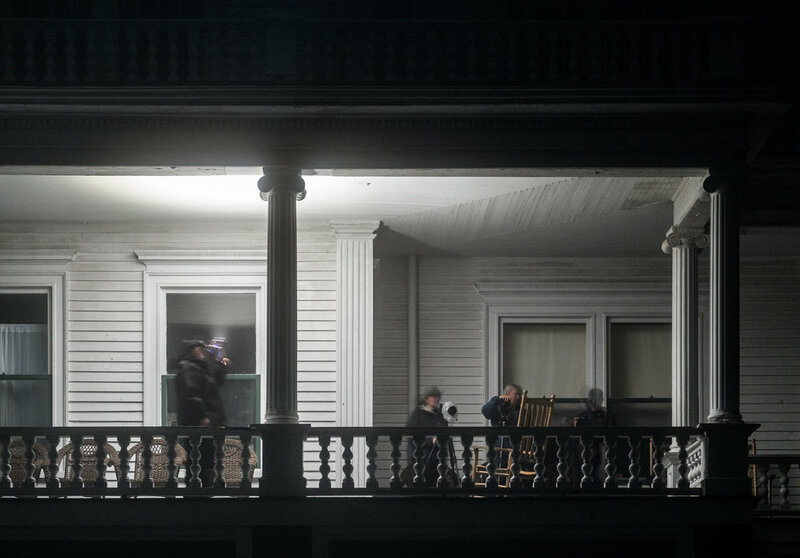 That flexibility of repetition was especially helpful for honing our light painting skills The variety of ways that we could interpret Sloss—wide overall exterior shots, tons of abstract details, and rooms that were pitch dark—offered infinite opportunities to create by adding light to the scene. 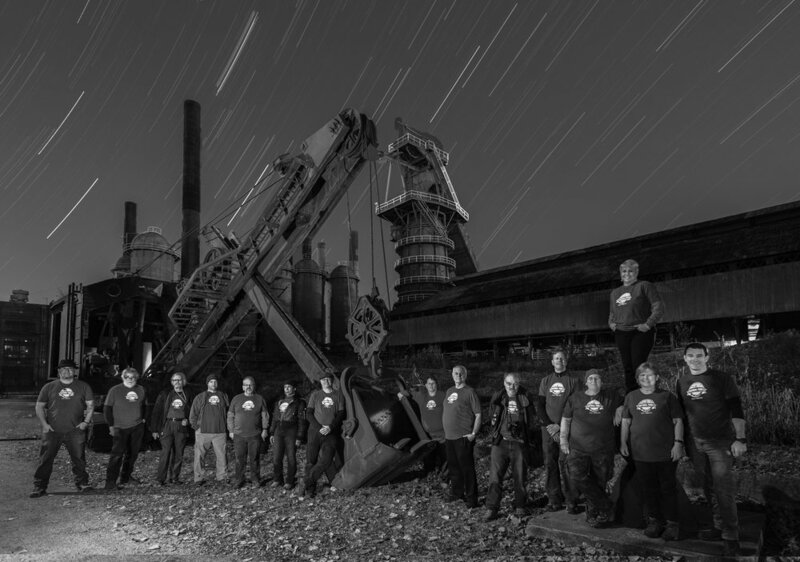 An unexpected surprise was the amount of stars that could be seen above the Furnaces. We could really heighten the sense of time against this timeless machinery. And because of the unseasonably cool temperatures, we were able to set up rigs to get 1-hour-plus exposures without much concern for long exposure noise in our images. Our classroom time was spent discussing black and white techniques, as well as sharing one another’s work. Each day we were eager to get back to Sloss and cover more ground. We were fortunate enough to witness an iron pour one night, as Sloss continues to operate a workshop area for educational purposes. We always end our workshops with a slideshow of our images, typically shared in our classroom. However, Sloss offered to have us showcase our images at their visitor center. The event was open to the public and showcased a nocturnal look at the site. We were also invited to have our work in a group show later in 2019. Rumor has it that we’ll be returning to Sloss as well as exploring other historic industrial sites in the near future! Our second partnership with Atlas Obscura was also a departure for us, in that this workshop was about not only night photography, but also astronomy. Out in the field with us day and night was Tyler Nordgren, astronomer and author of the book Stars Above, Earth Below: A Guide to Astronomy in the National Parks. 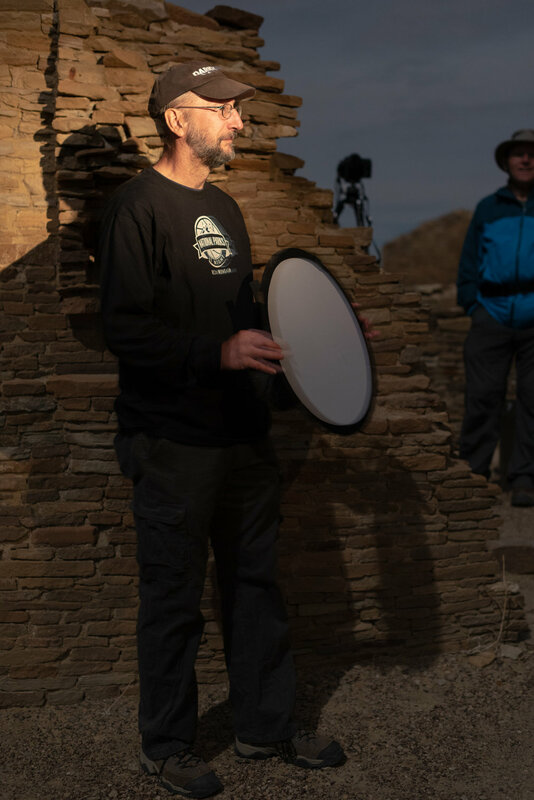 The workshop was an experience of photographing and exploring the night skies of the park’s most remote fascinations, including Racetrack Playa, Eureka Sand Dunes and the Wildrose Charcoal Kilns. We also visited some spots that are easier to access but are just as amazing, including Badwater Basin, Salt Creek Flats and Ubehebe Crater. And that was only the tip of the adventure iceberg. We rented red Jeeps from Farabee’s for hours upon hours of backcountry driving, we camped at the Racetrack, we enjoyed fresh-cooked chili at the tent site, and we shared an outdoor pancake and coffee breakfast on a very cold desert morning (after a very cold desert night). In addition to the night (and day) photography, Tyler continually waxed poetic about the universe above us. We learned about constellations and nebulae, we looked through his telescope and image-stabilizing binoculars at galaxies and a comet, and he taught us more than we could have imagined about the Milky Way and zodiacal light. We’re looking forward to many more opportunities to seize the night with both Tyler and Atlas Obsura. 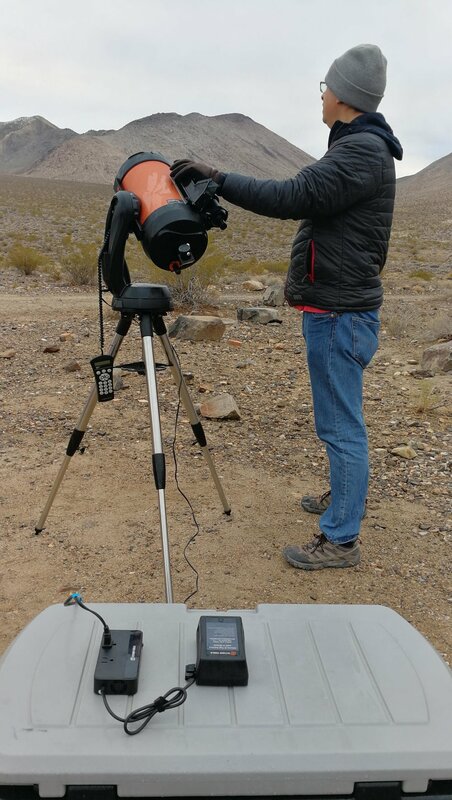 Astronomer Tyler Nordgren powered his telescope with one of the ONsite recharging packs that Tether Tools provided for our Death Valley backcountry workshop. We’ve said it before, and we’ll say it again: When we form brand partnerships, we look for the relationship to benefit our workshop attendees too. Nikon, Coast Portland, B&H Photo, Peak Design, Light Painting Brushes, X-Rite, BenQ, Bay Photo, Irix Lenses, Valleret, PhotoPills, Tether Tools and Luxli all offered loaner gear, discounts, gifts and other perks at various locations. As always, our gratitude is unending. Wow. 2018 was amazing. 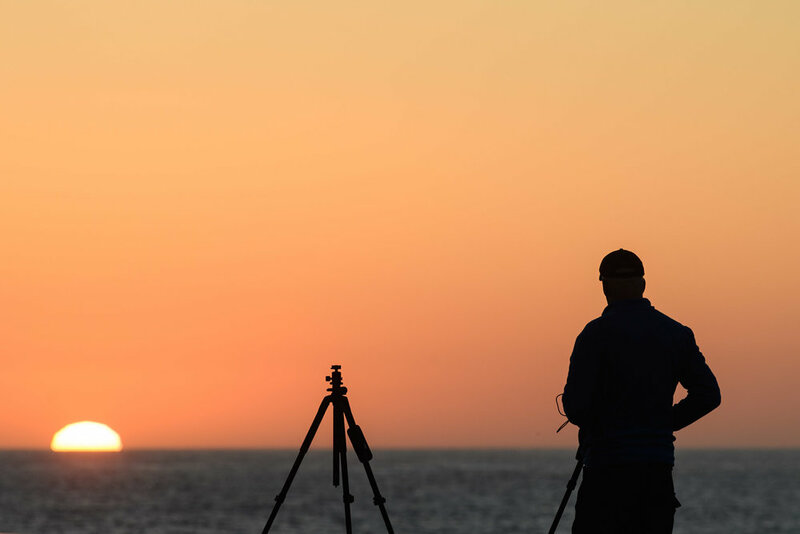 And we couldn’t have done it without all the photographers—ranging from 16 to 80ish, male and female, from night photography rookies to veterans—who attended and made these workshops and tours so memorable. It makes us want to do it again! And do it again we shall. If anything gets us more excited than our memories of 2018, it’s our anticipation for 2019. We’re heading to six national parks: Big Bend, Bryce Canyon, Glacier, Great Smoky Mountains, Grand Canyon and Lassen Volcanic. We’ll also be visiting Cape Cod, Devils Tower, the Outer Banks, San Francisco and Valley of Fire. We’re venturing overseas again too, to Morocco, Easter Island and Cuba. 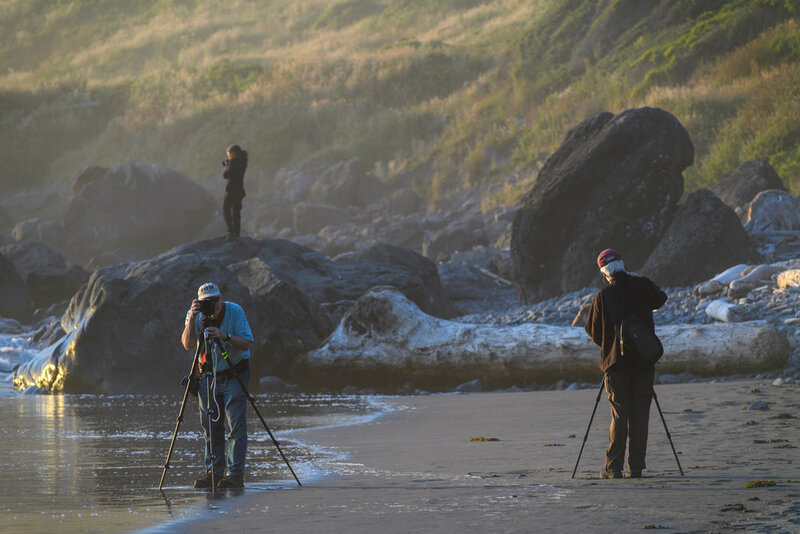 And we’re running two firsts: a Post-Processing Intensive in Catskill, New York, and a multinight backcountry backpacking adventure to Shi Shi Beach in Olympic National Park. Several of the 2019 workshops still have seats available. As for the sold-out experiences? You can still sign up for the waitlist for any workshop at no cost and with no risk. If a spot opens up, we’ll invite you to apply. So come join us, to seize the night! 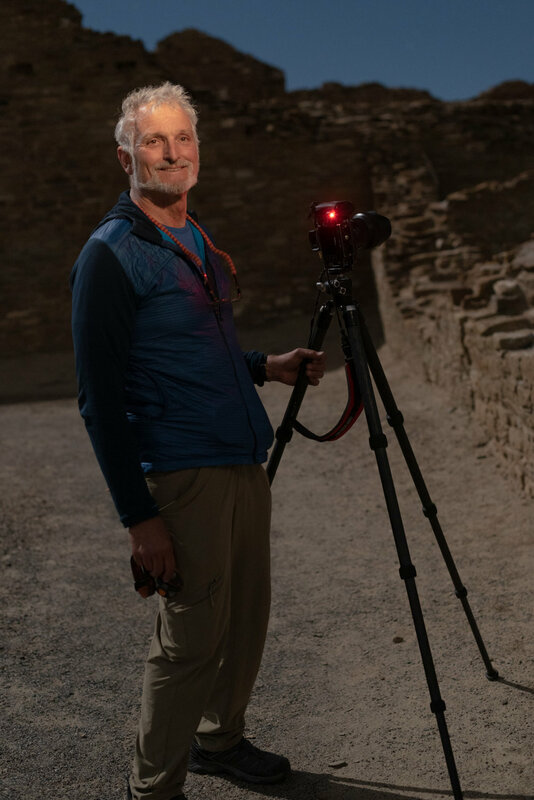 This installment of our “Five Questions” series features inquiries about light painting in national parks (hint: yes), focusing at night, an amazing national park in Utah, better batteries for the Luxli Viola, and the direction of star trails. A great example of low-level lighting: In Joshua Tree National Park, Arch Rock, at 30 feet high, was light-painted by just three battery-operated votive candles. Illumination barely visible to the naked eye even from close-up. Six stitched frames shot with a Nikon D750 and a Tamron 15-30mm f/2.8 lens at 15mm Photo © 2017 Lance Keimig. A: The headline of that article misled the reality of the situation. About 18 months later we still get this question, so let’s set the record straight. 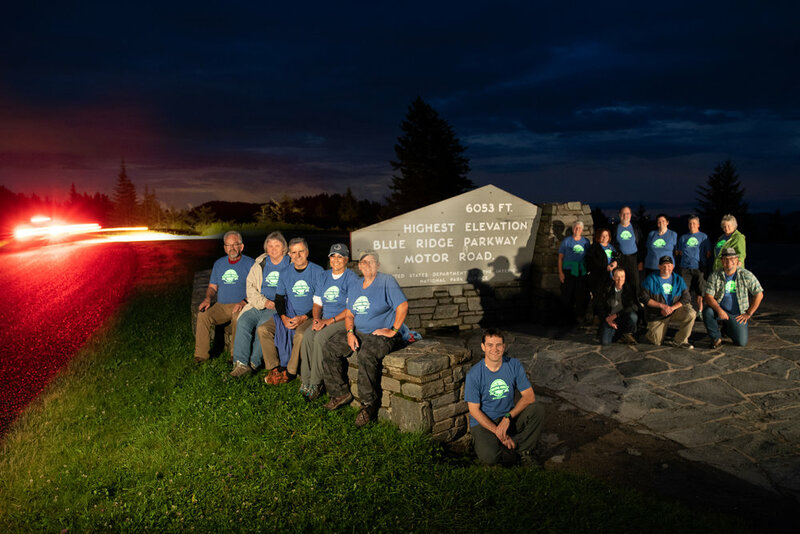 First of all, it is true that a few National Park Service units have gotten hesitant about light painting. However, as far as we are aware, this has happened at only five NPS units—out of about 420. So to insinuate that night photography is being hampered at all national parks is a massive overstatement. It should also be noted that of those five units, four (Arches National Park, Canyonlands National Park, Natural Bridges National Monument and Hovenweep National Monument) are administered by the same office, so it’s mostly just one rule that’s affecting a few places. It’s not like a bunch of parks have independently decided they don’t like night photography. In fact, we find that almost every park we visit loves the night, loves night photography, and encourages visitors to enjoy the darkness of the parkness either without or with a camera. Those four Utah NPS units acted with exactly that feeling in mind. Michael Hill, who works in the district, and with whom we have communicated, is very clear that they felt light painting “confuses visitors” and they leave because of this confusion. We get that, and we are respectful of it. However, that rule has been amended. As of earlier this year, those Utah parks allow Low-level Landscape Lightning (LLL), which is essentially very low levels of light that build up over the course of a long exposure. 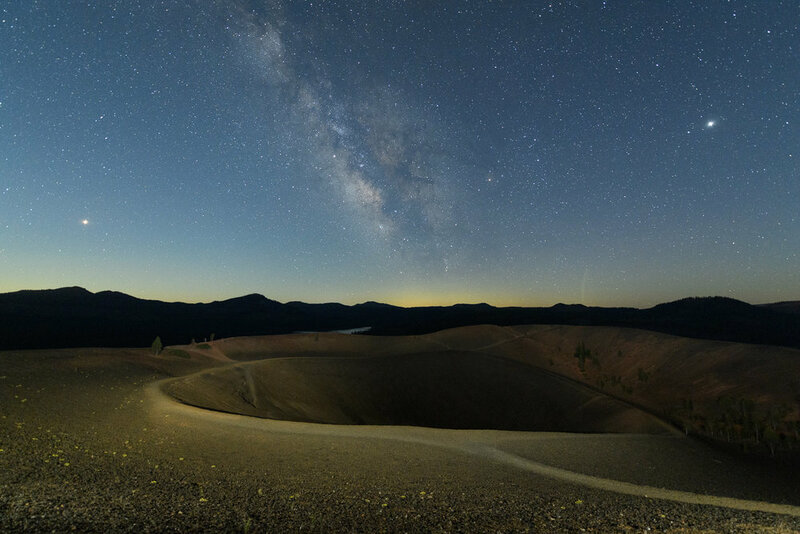 In Lassen Volcanic National Park, Lance and I used a pair of Luxli Viola panel lights to illuminate Cinder Cone, which is approximately 1,000 feet in diameter. We were relatively far away from our giant subject with relatively dim illumination. We could barely see where the light was hitting, but over the course of a 15-second exposure at a high ISO, that little bit of light was enough to do the job. Nikon D5 and 14-24mm f/2.8 lens. 15 seconds, f/3.2, ISO 6400. Photo © 2018 Chris Nicholson. In the case of the Utah parks, how low is acceptably “low-level”? Good follow-up question. When in Canyonlands last month, I asked a ranger, and he admitted the threshold is a bit subjective. He added that as long as the light isn’t disturbing wildlife or interfering with the enjoyment of other park visitors, then it’s probably OK. For commercial groups, the permit regulations stipulate that waving flashlights around is a no-no, but low-level static lighting is fine. So, that’s the scoop with that set of four Utah units. The fifth unit in question is Grand Teton National Park in the beautiful state of Wyoming. Grand Teton is an interesting case, because the park’s concern appears to really be in regard to shining artificial light on wildlife. We’re on board with whatever helps in that regard. Of course we don’t want to use flashlights for “spotting” wildlife, which in hunting is known as “jacklighting.” As people who use the parks for artistic inspiration and growth, we also have a responsibility to respect and preserve the natural environment, and that includes not disturbing the animals that call those places home. There are many ways to photograph Grand Teton National Park in low light without light painting—such as by moonlight. Nikon D3 and 28-70mm f/2.8 lens. 1/50, f/ 4, ISO 400. Photo © 2012 Chris Nicholson. Regardless of our personal feelings about any of this, National Parks at Night always preaches respect for the land, and that means respect for the park regulations, for equal access for all visitors, and for the rights of animals not to be blinded with sun-guns. To that end, on our workshops we are very clear that if someone from outside our group approaches with a light on or wants to walk where we are shooting, they have a right to do so. If they want to linger in the same place we’re shooting, they have a right to that too. We should all share the space, and we should all share the darkness. 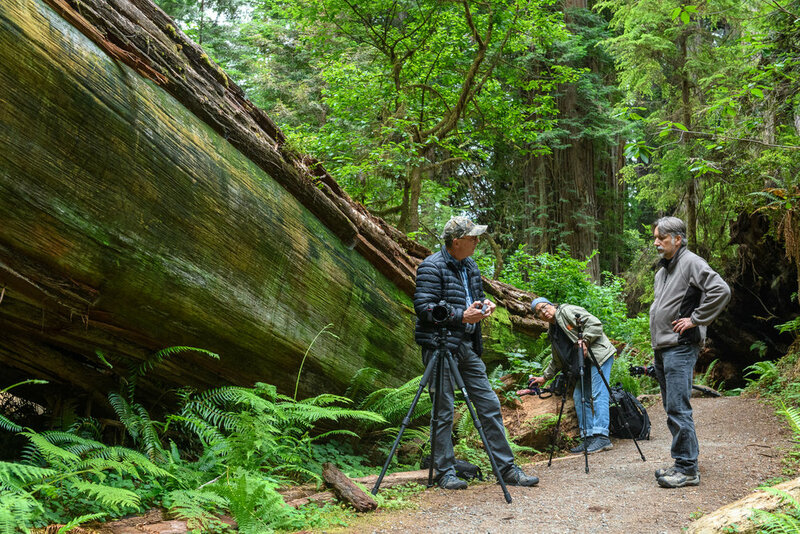 If what we as photographers are doing will disrupt another visitor’s enjoyment of the park, we can find another way or another moment to do it. Let’s end with this thought: Rather than making negative assumptions and predictions based on some (very few) new obstacles at a tiny minority of parks, we instead implore our fellow night photographers to ensure this does not become an actual issue anywhere else. How? By being responsible with our practices. That could be by employing LLL lighting techniques, or by light painting at a location only when alone or with other night photographers, or by shooting just the dark skies. Whatever works for you in the moment. Pemaquid Point, Maine, sharp from front to back after focusing to a hyperfocal distance of 18 feet. Nikon D750, Sigma 24mm f/4 lens. 488 seconds, f/3.5, ISO 800. 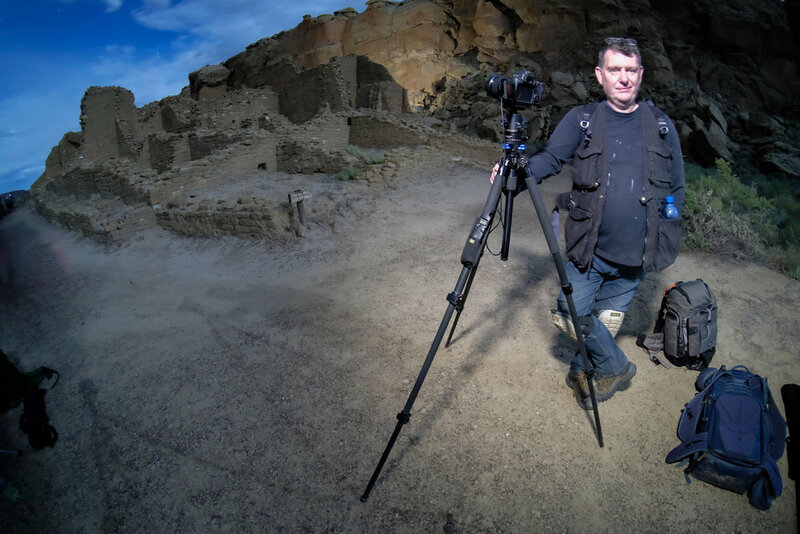 Q: On a recent night shoot at the Devils Garden in Utah, I was really disappointed in the fuzziness (not in good focus) of the rocks in the foreground of my shots. I may just have screwed up the focus on infinity, and I should have zoomed in on the first few shots to ensure clarity. Should I have focused on infinity and assured/assumed that the depth of field would maintain focus throughout the range, or should I have focused on a hyperfocal distance to ensure the full range of focus, which would have included my foreground rocks and out to infinity? — Michael D.
A: Anytime you have foreground subject matter, hyperfocal (providing it is done accurately) is the way to go. It’s a technique that is designed to maximize the available depth of field rather than focusing at infinity and sacrificing sharpness in your foreground. The night skies of Capitol Reef National Park are worth a trip. Nikon D750, Zeiss 15mm Distagon f/2.8 lens. 154 seconds, f/4, ISO 100. Photo © 2016 Matt Hill. A: There certainly are! Capitol Reef is an awesome place to view and photograph night skies—and they know it, and they’re happy to help you enjoy what they have. Q: I was first introduced to Matt and Chris through a seminar held at B&H Photo in New York City. 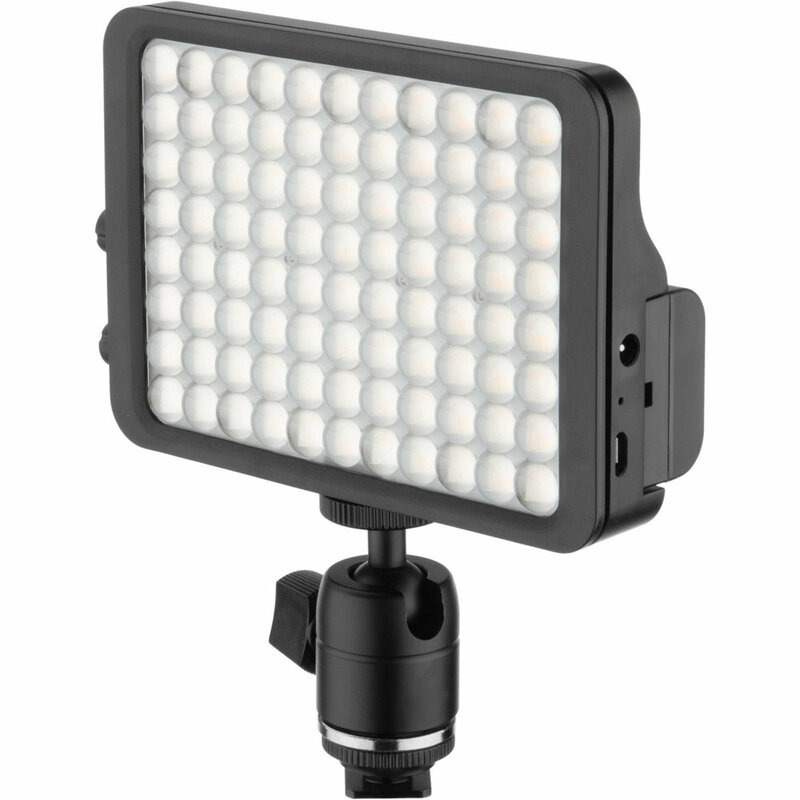 I proceeded to order the Luxli Viola LED light and am looking forward to working with it. I recall a reference to a better battery to use with the Viola than the one that comes with it (due to the short life of the battery), but I can’t find it in my notes. Please help me find the best battery for this kit. — Debi F.
A: First, I wouldn’t say the Viola’s battery has a short life. In fact, Chris claims to recharge his only every couple of months or so. That’s because he shoots mostly still photos, and he uses it only at night when very little power is needed to light a scene. But if your usage drains your Viola faster than you prefer, you can get more run time by using the Watson NP-F550 replacement battery, which from my experience is very reliable. If you want even longer run time for other applications—say, if you’re shooting video, when you’d probably leave the light on for hours at a time at full power—you can get the even larger Watson NP-F770 battery. That should about double your run time. Sotheast view in Sedona, Arizona. Nikon D4s, 14-24mm f/2.8 lens. 4 minutes, f/4, ISO 200. Photo © Tim Cooper. 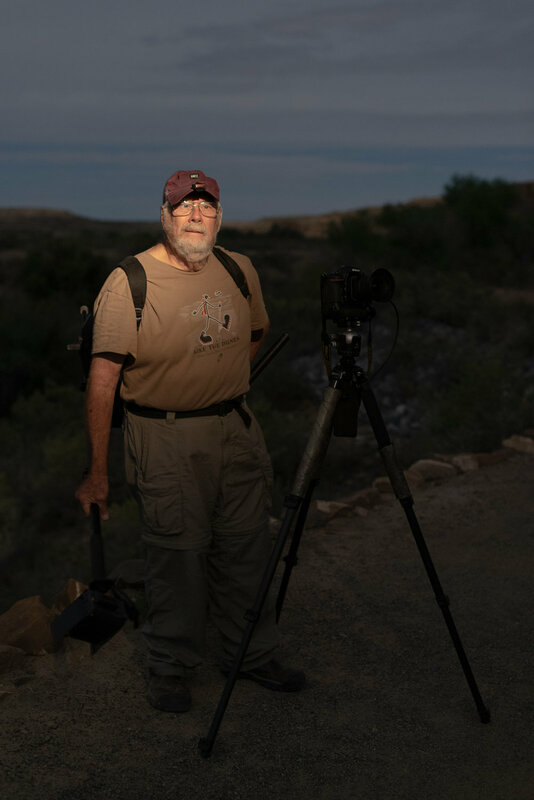 Q: In Tim’s recent blog post “Making the Move to Manual White Balance,” I can’t figure out how, in the last pair of photos outside Sedona, he managed to get the stars moving other than in concentric circles. Were some of them mirror-imaged to fill in areas where there was too much light, to let the stars show through? Thank you for satisfying my curiosity! — Marilyn O. A: No mirror-imaging involved or required! 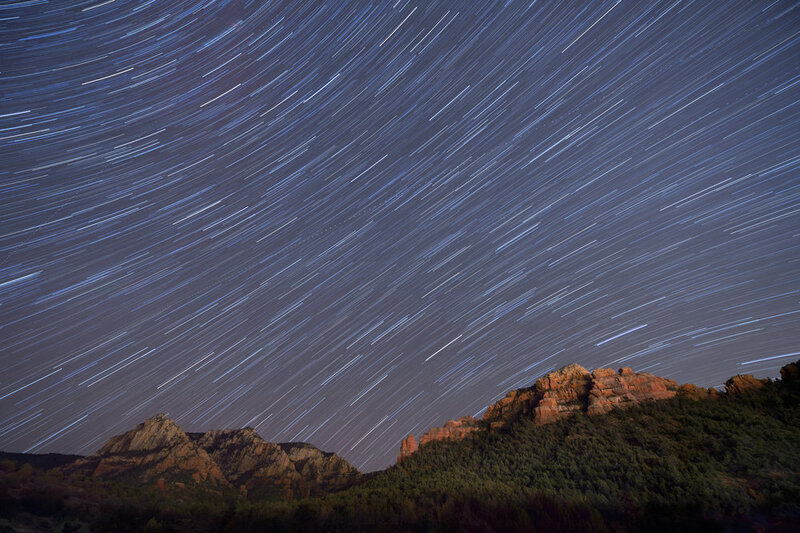 Star trails move in different directions, angles and arcs depending on which direction you’re facing. You get concentric rings from star trails only when you are shooting due north. When you are shooting east, they move from upper right to lower left. When you are facing west, stars move from upper left to lower right. When facing due south, the stars go nearly horizontal across your frame.